Have you ever popped a fresh cranberry in your mouth? They are so sour and bitter on their own! However, once mixed with sugar and cooked down they taste absolutely amazing. 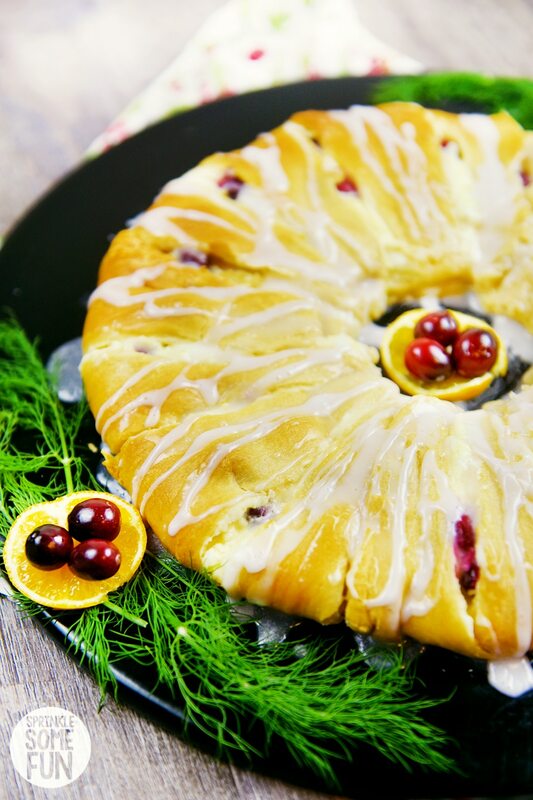 Desserts made with cranberries and oranges are one of my favorite treats! 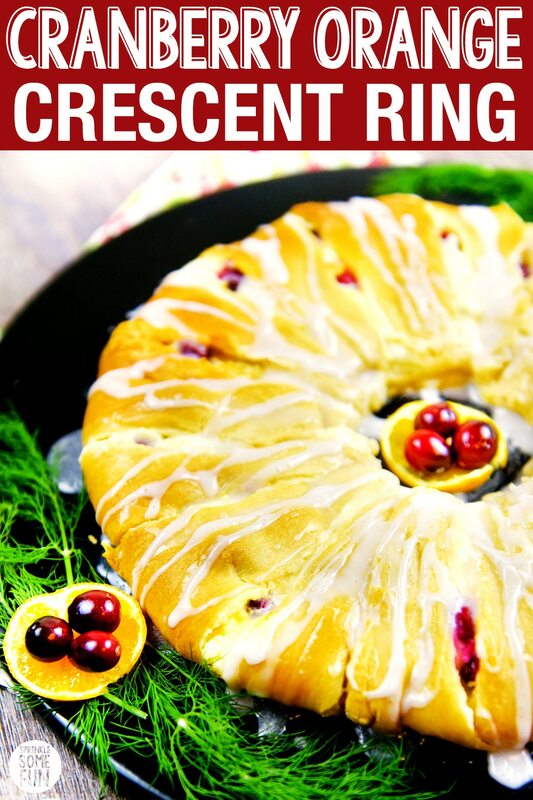 This Cranberry Orange Crescent Ring is a tasty and easy spin on a traditional danish tea ring. Thanksgiving was great this year, but it seemed so quick! Just two days after Thanksgiving my littlest sister got married and so we were busy with wedding plans the whole week. It’s almost the end of the year and now I am wondering where did 2016 go? Every year seems to pass by more quickly than the last, but at least we still have all the Christmas celebrations to go. Christmas parties are always my favorite and I love coming up with new recipes to impress my guests. 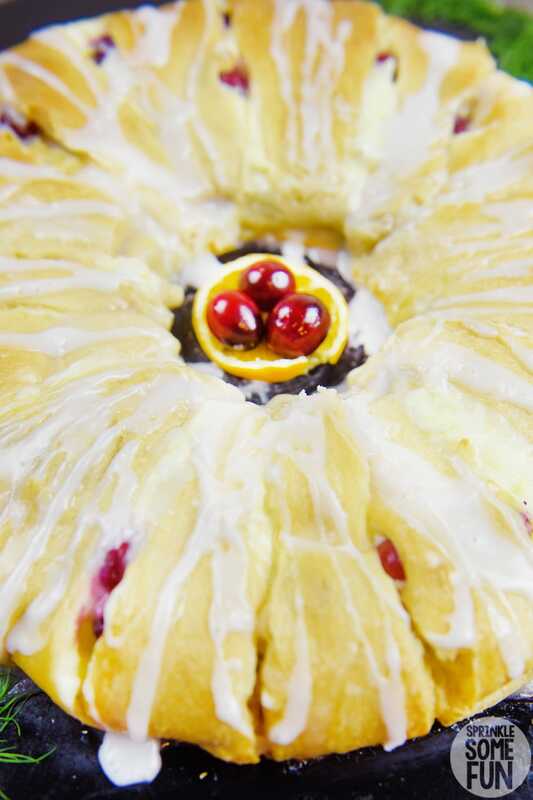 This Cranberry-Orange Cream Cheese Danish Ring was a creation that my middle sister, mom and I came up with recently. 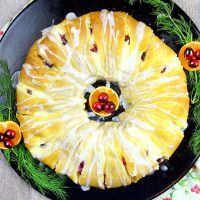 It’s so easy to make with a sweet and creamy danish cheese filling inside a ring of crescent rolls! 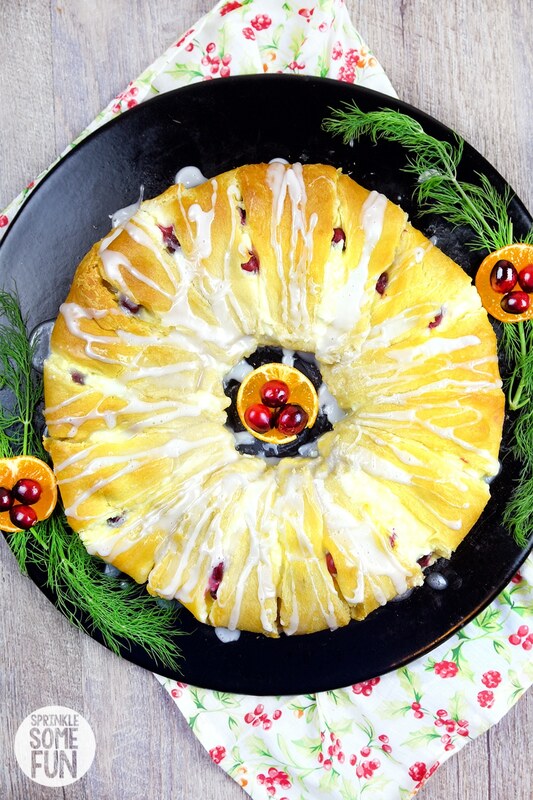 We loved the pairing of cranberries and oranges which makes a flavorful dessert or breakfast treat. Traditional cheese danish filling has either ricotta cheese or cottage cheese. I made this with my favorite Hiland Dairy cottage cheese. 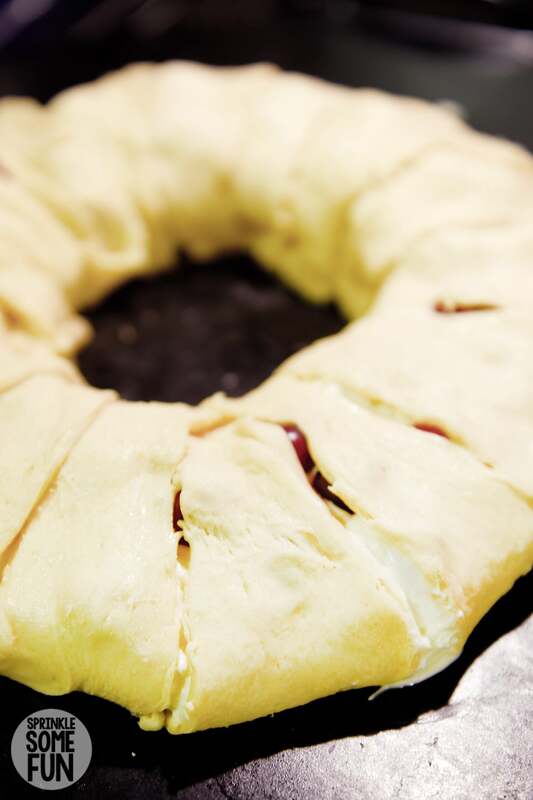 It’s the only brand of cottage cheese that I like and it made the perfect filling for this danish crescent ring. To make the ring I just placed the crescent rolls in a circle with the short sides of the crescent rolls to the inside of the ring on top of each other. Then I placed the filling on top of that. Next I just wrapped it up and sealed up the edges in the middle. It was super easy and quick to put together! Next I baked it at 350 degrees F for around 30 minutes or until the center of the ring was cooked through. 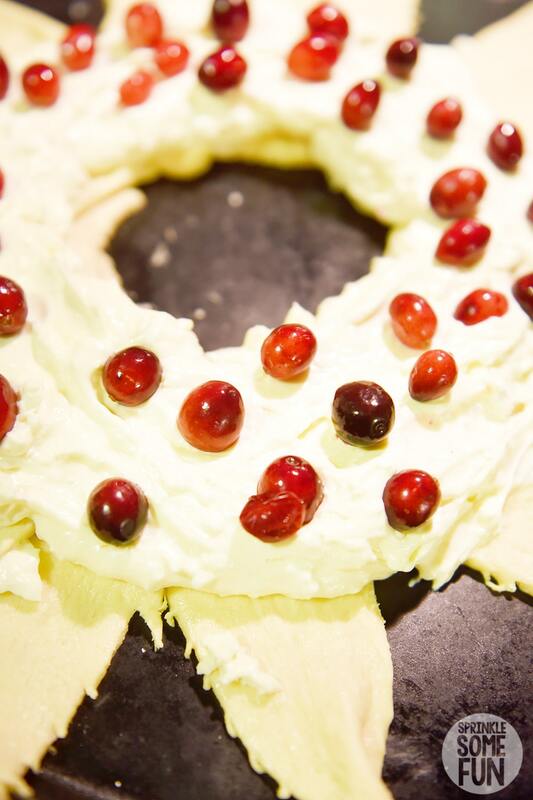 The orange and cranberries tasted so good with the tangy cream cheese and sweet icing! Even my kids loved this flavor combo and wanted more. This would make a great pastry breakfast idea too. I made the icing with Hiland Dairy milk and powdered sugar. It was the perfect finishing touch. We love using Hiland Dairy for our Christmas cooking. 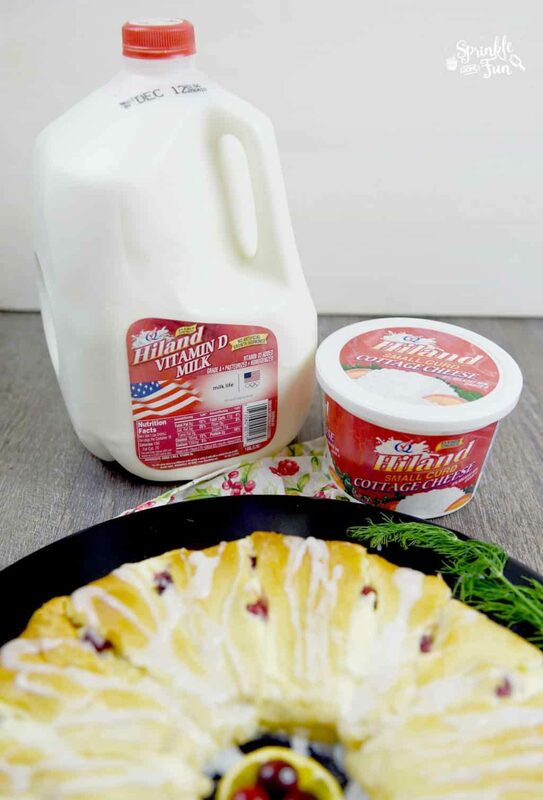 Milk, butter and whipping cream are all used a lot for the holidays and we love the fresh taste of Hiland Dairy products. Beat cream cheese, egg, cottage cheese, orange juice, orange zest, 1/2 cup powdered sugar and corn starch together for the filling. Place crescent rolls in a ring with the short sides in the middle and long points facing out. Put orange cheese filling around the middle and add cranberries. fold over the tops of the crescent rolls to the middle and press together. Bake at 350 degrees F for around 30 minutes or until the middle is cooked through. Drizzle mixture of powdered sugar and milk( should be thick but pourable) on top. Let cool and enjoy!